Research and development (R&D, R+D, or R'n'D), known in Europe as research and technological development (RTD), refers to innovative activities undertaken by corporations or governments in developing new services or products, or improving existing services or products. Research and development constitutes the first stage of development of a potential new service or the production process. 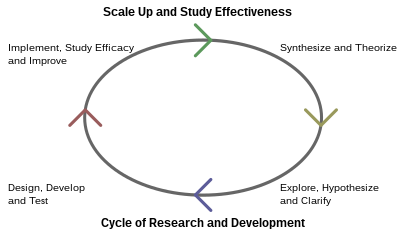 R&D activities differ from institution to institution, with two primary models of an R&D department either staffed by engineers and tasked with directly developing new products, or staffed with industrial scientists and tasked with applied research in scientific or technological fields, which may facilitate future product development. R&D differs from the vast majority of corporate activities in that it is not intended to yield immediate profit, and generally carries greater risk and an uncertain return on investment. However R&D is crucial for acquiring larger shares of the market through the marketisation of new products. New product design and development is often a crucial factor in the survival of a company. In a global industrial landscape that is changing fast, firms must continually revise their design and range of products. This is necessary as well due to the fierce competition and the evolving preferences of consumers. Without an R&D program, a firm must rely on strategic alliances, acquisitions, and networks to tap into the innovations of others. A system driven by marketing is one that puts the customer needs first, and produces goods that are known to sell. Market research is carried out, which establishes the needs of consumers and the potential niche market of a new product. If the development is technology driven, R&D is directed toward developing products to meet the unmet needs. In general, research and development activities are conducted by specialized units or centers belonging to a company, or can be out-sourced to a contract research organization, universities, or state agencies. In the context of commerce, "research and development" normally refers to future-oriented, longer-term activities in science or technology, using similar techniques to scientific research but directed toward desired outcomes and with broad forecasts of commercial yield. Statistics on organizations devoted to "R&D" may express the state of an industry, the degree of competition or the lure of progress. Some common measures include: budgets, numbers of patents or on rates of peer-reviewed publications. Bank ratios are one of the best measures, because they are continuously maintained, public and reflect risk. In the United States, a typical ratio of research and development for an industrial company is about 3.5% of revenues; this measure is called "R&D intensity". A high technology company, such as a computer manufacturer, might spend 7% or a pharmaceutical companies such as Merck & Co. 14.1% or Novartis 15.1%. Anything over 15% is remarkable, and usually gains a reputation for being a high technology company such as engineering company Ericsson 24.9%, or Allergan a biotech company, tops the spending table with 43.4% investment Such companies are often seen as credit risks because their spending ratios are so unusual. Generally such firms prosper only in markets whose customers have extreme high technology needs, like certain prescription drugs or special chemicals, scientific instruments, and safety-critical systems in medicine, aeronautics or military weapons.The extreme needs justify the high risk of failure and consequently high gross margins from 60% to 90% of revenues. That is, gross profits will be as much as 90% of the sales cost, with manufacturing costing only 10% of the product price, because so many individual projects yield no exploitable product. Most industrial companies get 40% revenues only. On a technical level, high tech organizations explore ways to re-purpose and repackage advanced technologies as a way of amortizing the high overhead. They often reuse advanced manufacturing processes, expensive safety certifications, specialized embedded software, computer-aided design software, electronic designs and mechanical subsystems. Research from 2000 has shown that firms with a persistent R&D strategy outperform those with an irregular or no R&D investment program. Research and development are very difficult to manage, since the defining feature of research is that the researchers do not know in advance exactly how to accomplish the desired result. As a result, "higher R&D spending does not guarantee more creativity, higher profit or a greater market share". Research is the most risky financing area because both the development of an invention and its successful realization carries uncertainty including the profitability of the invention. One way entrepreneurs can reduce these uncertainties is to buy the licence for a franchise, so that the know-how is already incorporated in the licence. In general, it has been found that there is a positive correlation between the research and development and firm productivity across all sectors, but that this positive correlation is much stronger in high-tech firms than in low-tech firms. In research done by Francesco Crespi and Cristiano Antonelli, high-tech firms were found to have "virtuous" Matthew effects while low-tech firms experienced "vicious" Matthew effects, meaning that high-tech firms were awarded subsidies on merit while low-tech firms most often were given subsidies based on name recognition, even if not put to good use. While the strength of the correlation between R&D spending and productivity in low-tech industries is less than in high-tech industries, studies have been done showing non-trivial carryover effects to other parts of the marketplace by low-tech R&D. Global R&D management is the discipline of designing and leading R&D processes globally, across cultural and lingual settings, and the transfer of knowledge across international corporate networks. President Barack Obama requested $147.696 billion for research & development in FY2012, of which 21% was destined to fund basic research. Research and innovation in Europe are financially supported by the programme Horizon 2020, which is open to participation worldwide. A notable example is the European environmental research and innovation policy, based on the Europe 2020 strategy which will run from 2014 to 2020, a multidisciplinary effort to provide safe, economically feasible, environmentally sound and socially acceptable solutions along the entire value chain of human activities. In 2015, research and development constituted an average 2.2% of the global GDP according to the UNESCO Institute for Statistics. ^ a b c Staff, Investopedia (2003-11-25). "Research And Development – R&D". Investopedia. Retrieved 2017-12-12. ^ Anderson, James C.; Narus, James A. (1998-11-01). "Business Marketing: Understand What Customers Value". Harvard Business Review (November-December 1998). ISSN 0017-8012. Retrieved 2019-02-06. ^ ChartsBin. "Research and Development Employees by Country". ChartsBin. Retrieved 2019-02-06. ^ Khan, Firdos Alam (2018-09-03). Biotechnology Fundamentals. CRC Press. ISBN 9781498723459. ^ All figures UK R&D Scoreboard Archived 2005-10-27 at the Wayback Machine as of 2006[update]. ^ Dingwall, Robert; McDonnell, Mary Byrne (2015-06-26). The SAGE Handbook of Research Management. SAGE. ISBN 9781473914452. ^ "Aerospace and Defense: Inventing and Selling the Next Generation" (PDF). Center for Strategic and International Studies. Center for Strategic and International Studies, International Security Program. December 5, 2009. p. 1. Retrieved 6 August 2017. ^ "Investor-partner business partner finder Business dictionary". ^ Ortega-Argiles, Raquel; Potters, Lesley; Vivarelli, Marco (2011). "R&D and productivity: testing sectoral peculiarities using micro data". Empirical Economics. 41 (3): 817–839. doi:10.1007/s00181-010-0406-3. ^ Ortega-Argiles, Raquel; Piva, Mariacristina; Vivarelli, Marco (2011). "Productivity Gains from R&D Investment: Are High-Tech Sectors Still Ahead?". IZA Discussion Papers. IZA (5975): 1–22. ^ Crespi, Francesco; Antonelli, Cristiano (2011). "Matthew Effects and R&D Subsidies: Knowledge Cumulability in High-Tech and Low-Tech Industries". Working Papers. Università degli Studi Roma Tre (140): 1–24. ^ Mendonca, Sandro (2009). "Brave Old World: Accounting for 'High-Tech' Knowledge in 'Low-Tech' Industries". Research Policy. 38 (3): 470–482. doi:10.1016/j.respol.2008.10.018. ^ "European Commission - PRESS RELEASES - Press release - Horizon 2020 – the EU's new research and innovation programme". europa.eu. ^ "European Commission – PRESS RELEASES – Press release – Horizon 2020: Commission proposes €80 billion investment in research and innovation, to boost growth and jobs". europa.eu. Retrieved 2017-12-12. ^ "EUR-Lex – 02013R1291-20150704 – EN – EUR-Lex". eur-lex.europa.eu. Retrieved 2017-03-16. ^ "Research and development expenditure (% of GDP) | Data". data.worldbank.org. Retrieved 2017-12-12. Wikimedia Commons has media related to Research and development. This page was last edited on 10 April 2019, at 03:03 (UTC).